How Much Does it Cost To Fly To Buffalo? The cheapest flights to Buffalo found within the past 7 days were $91. Prices and availability subject to change. Additional terms may apply. Dallas-Fort Worth Intl. - Buffalo Niagara Intl. As flights to Buffalo descend from the sky, breathtaking views of Lake Ontario and Lake Erie greet the region’s visitors. Once you plant your feet on Upstate soil, the adventure really begins. Here in the City of Good Neighbors, join the community for fireworks over Canalside, awe-inducing historic tours, and nights of passion and plot twists at the many performing arts venues. Buffalo flights take you into Buffalo Niagara International Airport (BUF), which is the main tourism transportation hub for the Niagara region. Fill your itinerary with a cultural cornucopia in the city and journey to the mist and majesty of Niagara Falls. You’ll touch down at BUF, just 10 miles northeast of downtown Buffalo and 25 miles southeast of Niagara Falls. 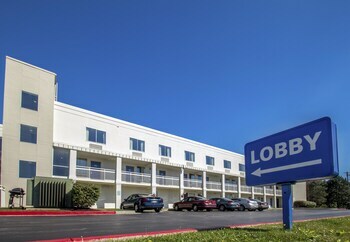 There are plenty of hotels close to Buffalo Niagara International Airport, and each one is a convenient and comfortable home base between the city and the scenic route. Renting a car is the best way to thoroughly explore the area, but if you prefer not to drive, you can call your hotel for shuttle service from the Hotel Guide phone board located at baggage claim. Public transportation is available with NFTA Metro Bus and Rail service, too, for when you want to leave the navigation to a local. Once you get to your room and drop off your bags and head west into the city for a bite to eat in the Kensington or Lasalle neighborhoods, both located just west of U.S. Interstate 90. Whether you’re planning a string of hot tickets at Upstate theaters or craving quiet time among the cascades, you’ll find cheap flights to Buffalo right here with Travelocity. That’s because we keep our price-matching promise: If you find a lower price we will match the rate and refund the difference. Save even more when you curate one of our custom Buffalo, NY vacation packages with fabulous flights and a convenient hotel. Question : Where can I find cheap flights to Buffalo? Answer : We know you’re looking for the best flights at the lowest fares, so we found some of the sweetest deals in town just for you. Check out the top flight deals to Buffalo. Act quickly and score yourself a bargain! JetBlue Airways has a flight from to Buffalo departing on 4/23/19 and returning on 4/26/19 all for only $111.00 per person. * Book these JetBlue Airways flights! United has a flight from to Buffalo departing on 4/30/19 and returning on 5/3/19 all for only $157.00 per person. * Book these United flights! JetBlue Airways has a flight from to Buffalo departing on 5/22/19 and returning on 5/24/19 all for only $170.00 per person. * Book these JetBlue Airways flights! Question : What are the most popular airlines that fly to Buffalo? Delta Air Lines Flies 349 flights per week between and Buffalo. American Airlines Flies 225 flights per week between and Buffalo. Southwest Airlines Flies 205 flights per week between and Buffalo. Question : Which hotels are located near airports or major attractions in Buffalo? Answer : We've put together a list of hotels in Buffalo close to airports and popular sights to see. Check out the hotels below. All of them are within proximity to must-see attractions and major airports in and around the city of Buffalo. Hyatt Regency Buffalo / Hotel and Conference Center: Facing Main Street and the trolley, Hyatt Regency Buffalo / Hotel and Conference Center has direct access to the convention center and is within 3 blocks of Niagara Square and Chippewa Street nightlife. This hotel has a 3.50 star rating. Adam's Mark Buffalo: This downtown hotel is a half-mile from First Niagara Center and Coca-Cola Field; Niagara Falls is 20 miles away. This hotel has a 3.00 star rating. 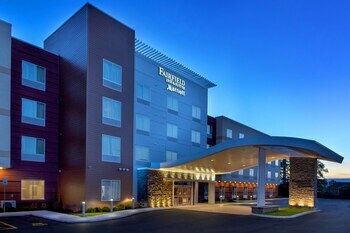 Embassy Suites Buffalo: Embassy Suites Buffalo is in the downtown business district, just off highway I-190 and a free 15-minute shuttle ride from the airport. Guests can catch a train to Chippewa Entertainment District or head for Lake Erie - less than 2 miles (3.2 km) away - o This hotel has a 3.50 star rating. 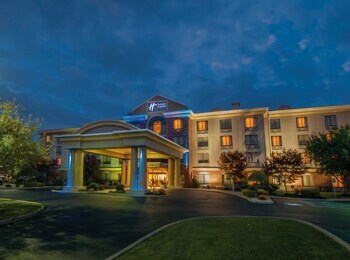 Days Hotel Buffalo Airport: Situated near the airport, this hotel is 1 mi (1.5 km) from Diamond Hawk Golf Course and within 3 mi (5 km) of Patriots and Heroes Park and Walden Galleria Mall. Island Park and Glen Falls are also within 6 mi (10 km). This hotel has a 2.50 star rating. Question : What are the top attractions in Buffalo? Answer : Buffalo has over 94 points of interest for you to choose from. We suggest checking out Ralph Wilson Stadium and Delaware Park first because they are the most popular attractions in Buffalo. Don't forget about other highly recommended spots like Kleinhans Music Hall, Peace Bridge, and Northtown Center at Amherst. Get out there and see what the city has to offer on your trip to Buffalo! It was relaxed nice atmosphere. We liked the coffee shop and the bar. This downtown hotel is a half-mile from First Niagara Center and Coca-Cola Field; Niagara Falls is 20 miles away.